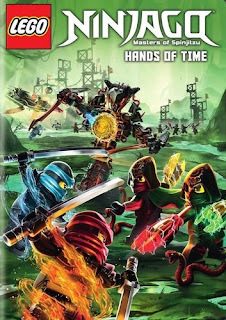 It is shortly after the Day of the Departed and all has returned to normal in Ninjago. While the Ninjas are back at the museum cleaning up the mess they left behind, Master Wu waits alone at his old monastery. Soon, there is a flash of light and a stranger mysteriously appears who turns out to be an old enemy. Wu and the stranger engage in an epic battle which we soon learn is the finale of a fight that began forty years ago between the Elemental Masters and the Hands of Time. Who are the Hands of Time? Krux and Acronix, two fallen Elemental Masters who could once control time itself before Wu and Garmadon barely managed to strip them of their time-shifting powers and transfer them into four time blades! Wu and Garmadon sent the Blades into a temporal vortex and Krux and Acronix followed, leading our heroes to think the threat was over in Season 7 of LEGO NINJAGO: Masters of Spinjitzu. I watched this the other day and well just like any of the others Lego cartoons this show is very entertaining for young and old. The story lines are fantastic, voice acting and the animation are absolutely wonderful. If you have a child/granchild/ niece or nephew who just loves anything Lego they will love this one.